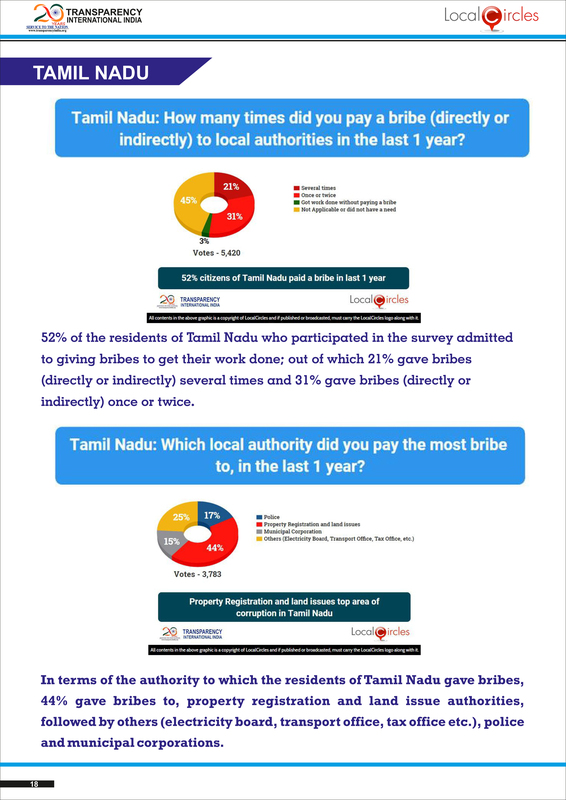 LocalCircles in collaboration with Transparency International India has recently conducted an Online National Survey to ascertain the level of corruption in the country and check the citizen pulse on it. 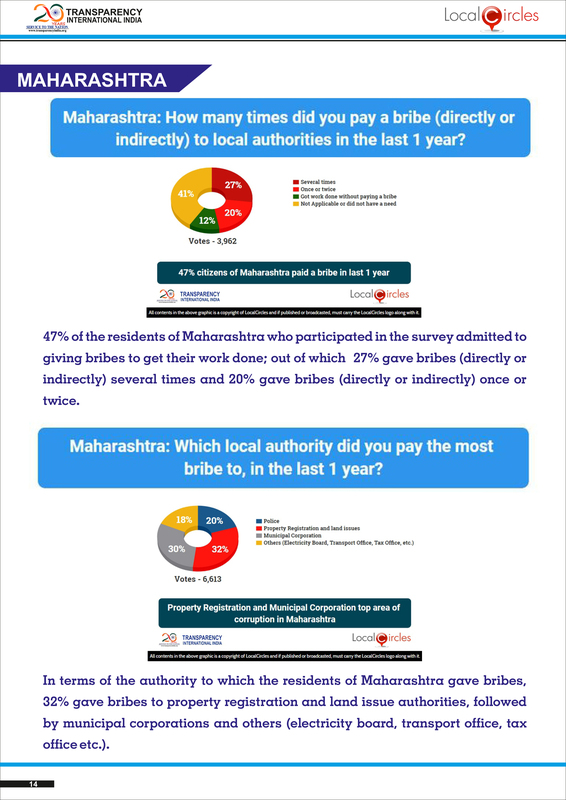 The data collected from the survey has been compiled in a comprehensive report called the ‘India Corruption Survey 2018’. Over 160,000 response were received from over 50,000 unique citizens. 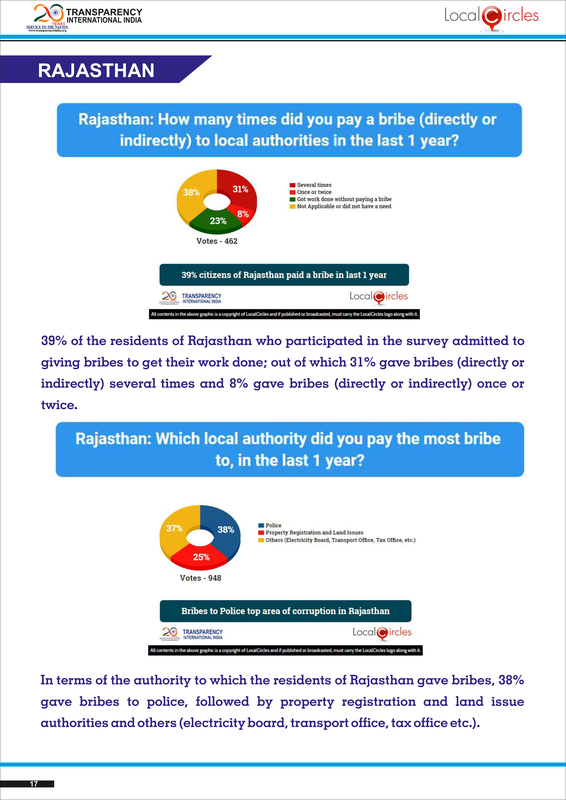 The survey has been conducted at an opportune time as the new Prevention of Corruption (Amendment) Act, 2018 has been passed by the Indian Parliament and it is set to transform the anti-corruption regime in the country. Along with that, since India’s ranking in the Corruption Perception Index 2017 has slid down from 79th to 81st position, it is essential to understand the ever-widening spread of corruption and address the issues at hand swiftly. 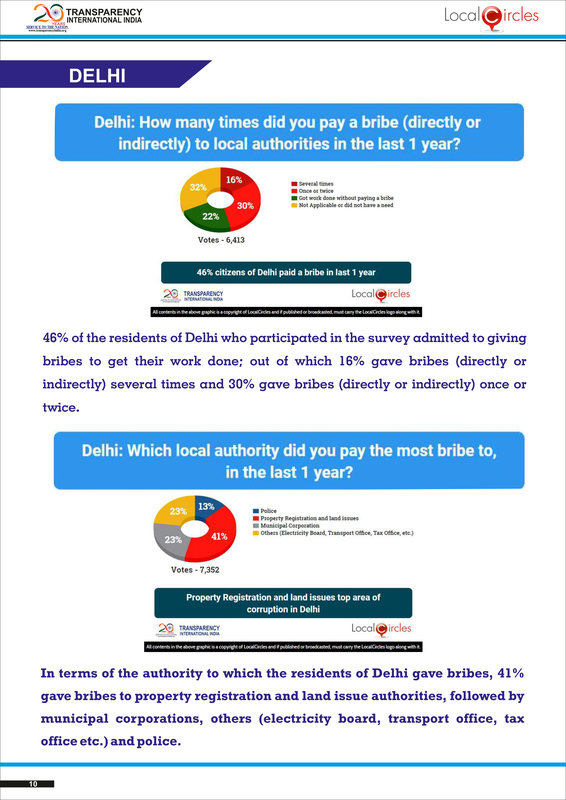 45% citizens of the country had paid bribes, according to the last year’s survey. 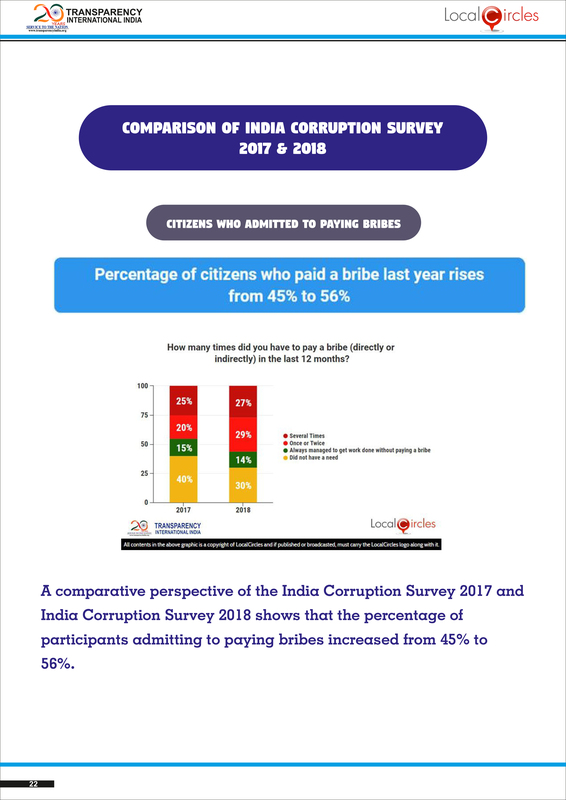 But this year’s survey reveals a definite and noticeable increase in the number of times bribes are paid by the citizens either directly or indirectly. The increased percentage of citizens is 54%. 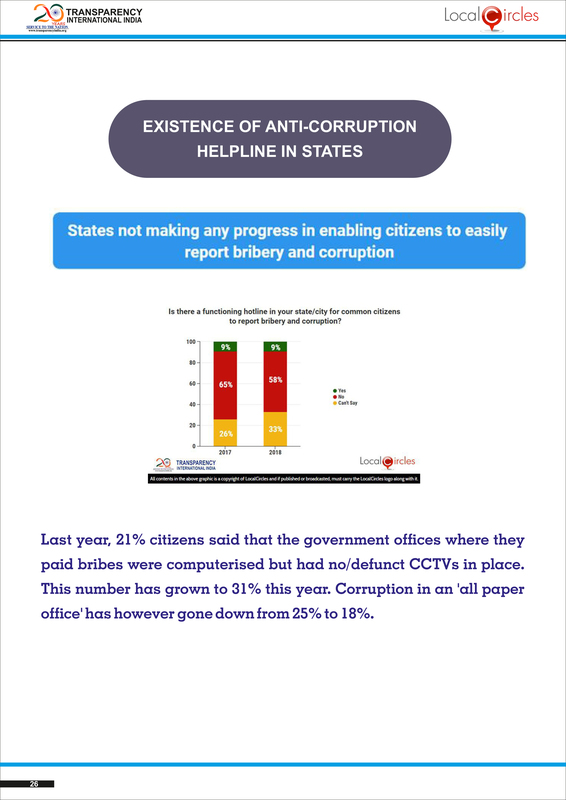 According to the survey, 58% of the citizens said their states had no anti-corruption helpline. Whereas as many as 33% said they were not aware of the presence of such helpline in their states. 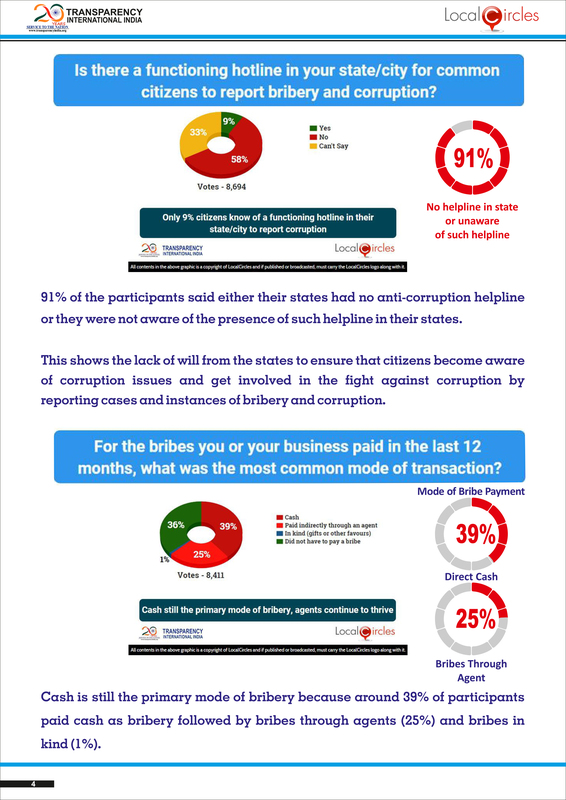 This shows the lack of will from the states to ensure that citizens become aware of corruption issues and get involved in the fight against corruption by reporting cases and instances of bribery and corruption. 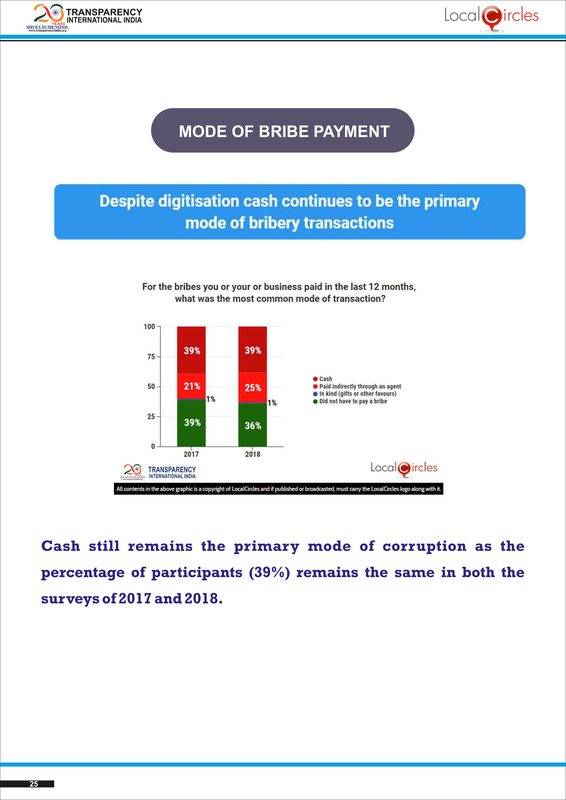 It seems cash is still the primary mode of bribery because around 39% paid cash as bribery, followed by bribes through agents (25%), bribes in kind (1%). Police authorities have been paid the most bribes by the citizens in the last year (25%), followed by municipal corporations, property registrations and other authorities (electricity board, transport office, tax office etc.). 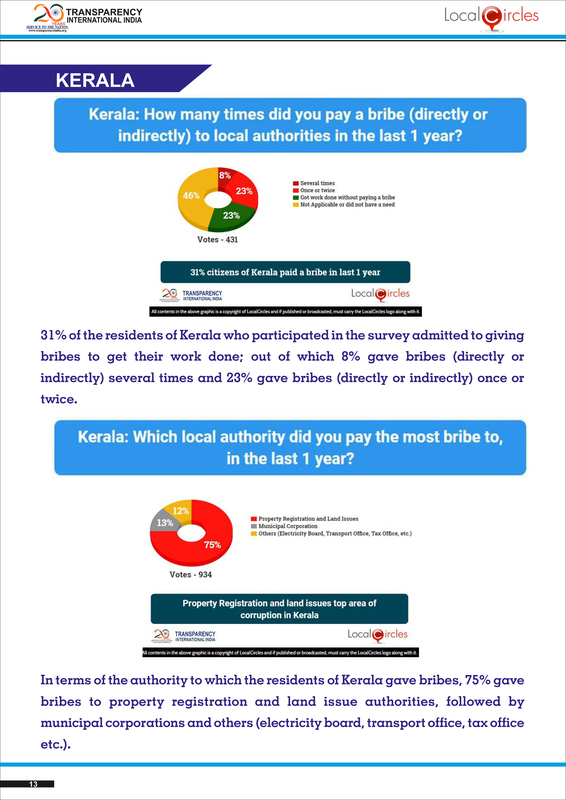 An interesting thing to note is that despite computerisation of government offices, cases of bribery have continued. 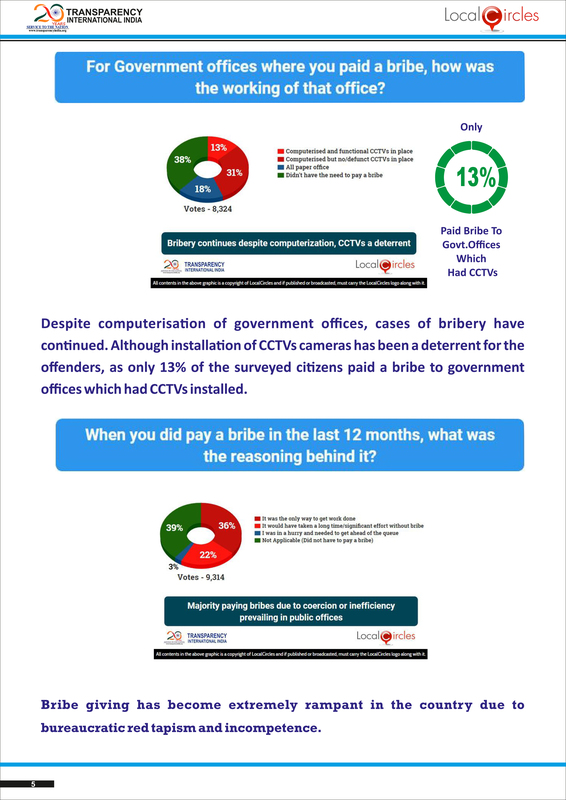 Although installation of CCTVs cameras has been a deterrent for the offenders, as only 13% of the surveyed citizens paid a bribe to government offices which had CCTVs installed. This survey also revealed that bribe giving has become so rampant in the country just for the purpose of getting the work done conveniently without wastage of time and effort. 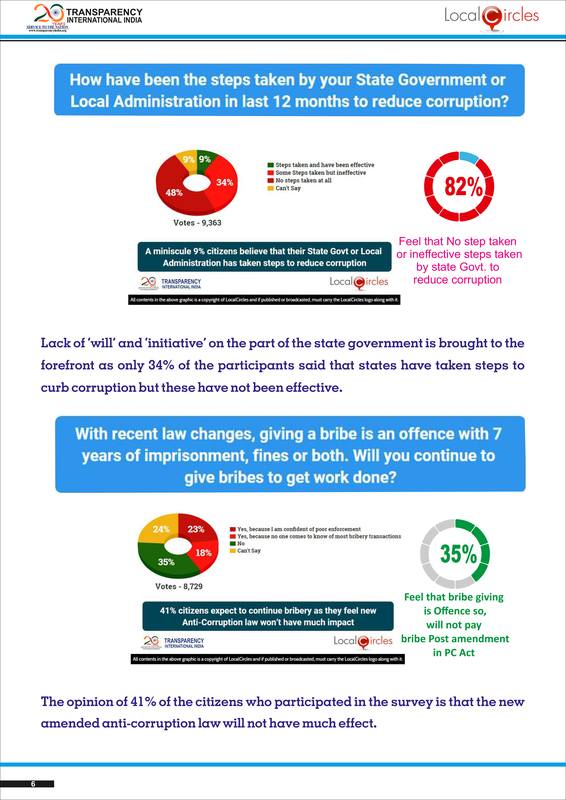 Lack of will and initiative on the part of the states is also brought to the forefront as only 34% of the citizens said that states have taken steps to curb corruption, but these have not been effective. 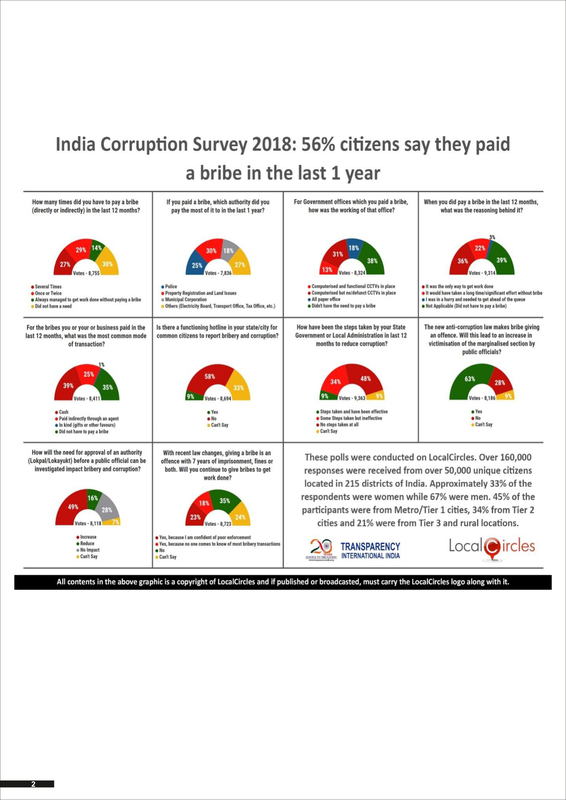 Transparency International India and LocalCircles through this survey have also tried to gather opinions of the citizens of India on the recent changes in the anti-corruption law. 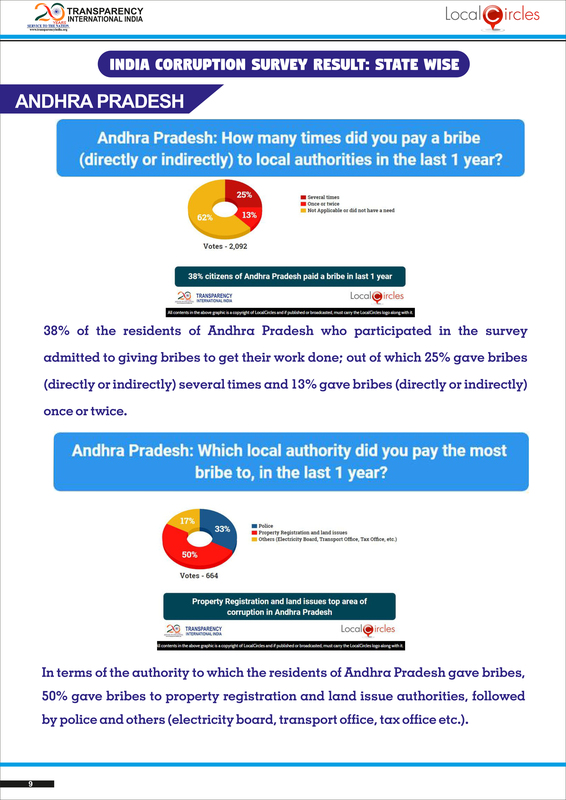 Since, the law has made bribe giving an offence with 7 years of imprisonment or fine or both; it was shocking to see that 23% agreed that they will continue giving bribes to get work done because they doubt the enforcement of the act. This means the citizens have a feeling that the new anti-corruption law will not have much effect. 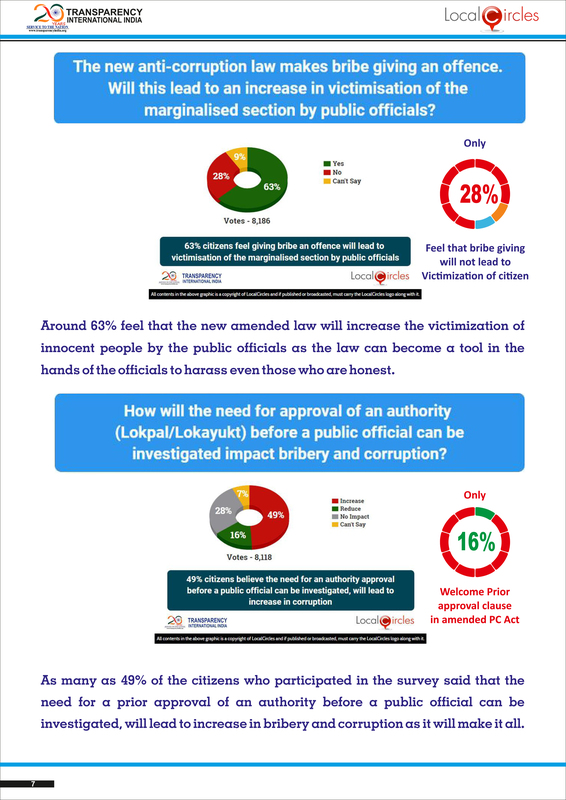 Around 63% also feel that the new amended law will increase the victimization of people by the public officials because they feel that the law will become a tool in the hands of the officials to harass even those who are honest. Along with that, as many as 49% of the citizens said the need for a prior approval of an authority before a public official can be investigated, will lead to increase in bribery and corruption as it will make it all the more difficult to prosecute the corrupt officials quickly. 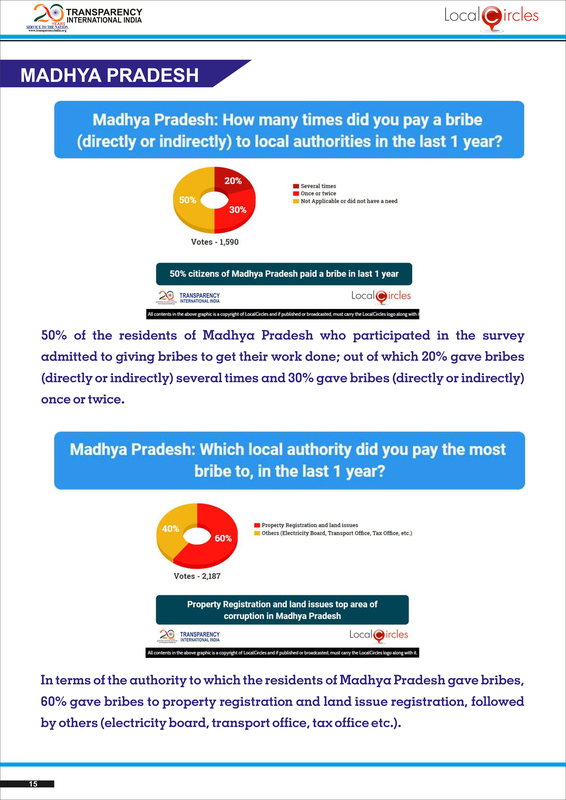 An attempt has also been made to compare the results of the last year’s survey with this latest survey so that it can be understood if any progress has been made in the fight against corruption. 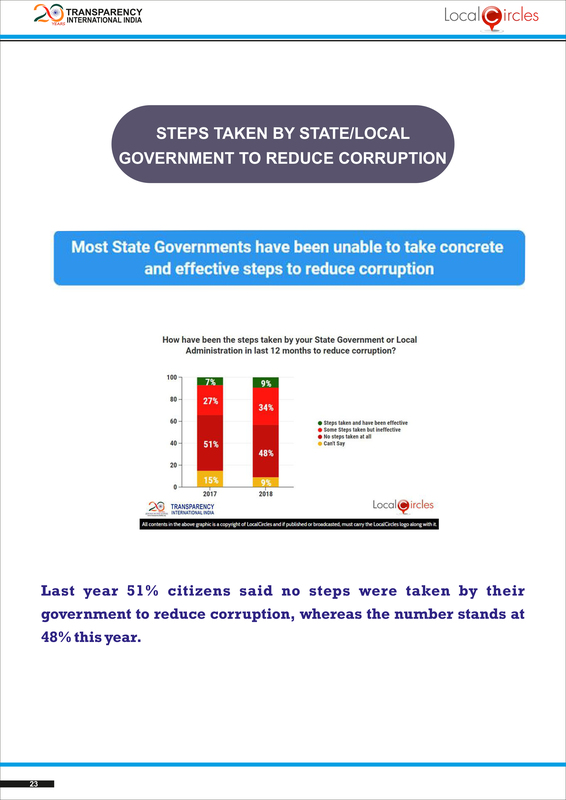 Last year 51% citizens said no steps were taken by their government to reduce corruption. That number stands at 48% this year. 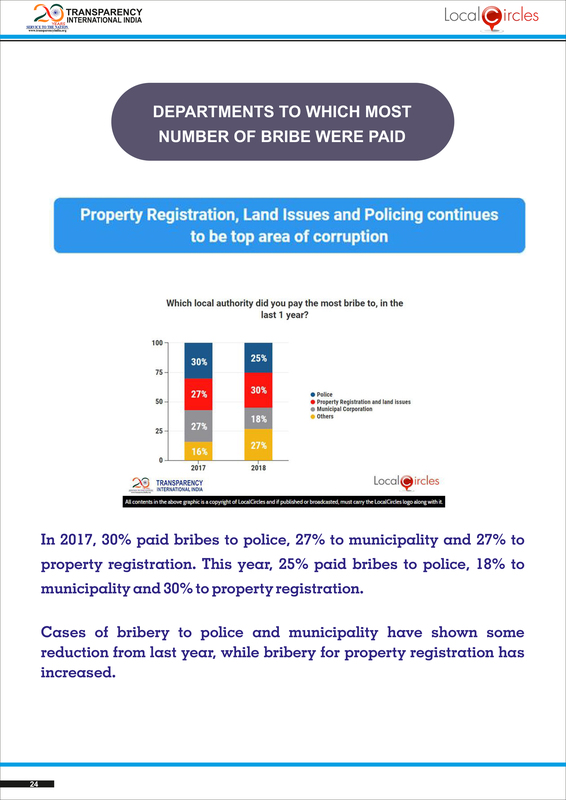 In 2017, 30% paid bribes to police, 27% to municipality and 27% for property registration. 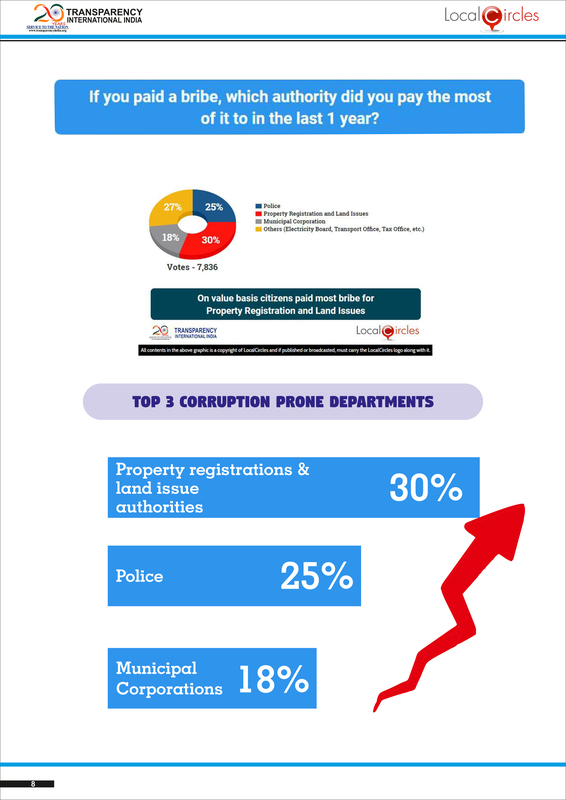 This year, 25% paid bribes to police, 18% to municipality and 30% for property registration. 36% this year and last year said giving bribes was the only way to get their work done. 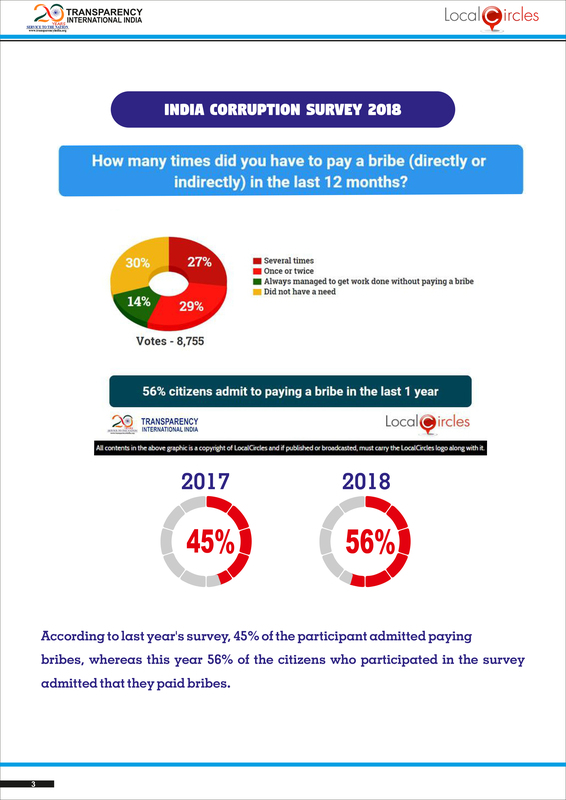 The percentage of citizens who said they did not have to pay a bribe to get their work done also reduced from last year’s 43% to 39% this year. Cash is still the king with 39% in both 2017 and 2018 using cash as the primary mode of bribe transaction. Technology has not had much effect in curbing corruption in Government offices. 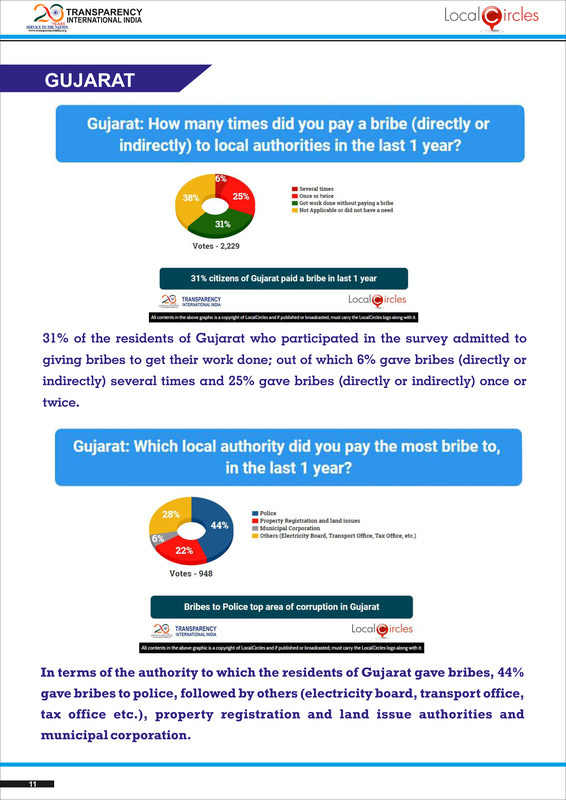 Last year, 21% citizens said that the government offices where they paid bribes were computerised but had no/defunct CCTVs in place. This number has grown to 31% this year. Corruption in an ‘all paper office’ has however gone down from 25% to 18%. Out of the 13 states of India in which the survey was conducted, Gujarat, Kerala and Andhra Pradesh turned out to be the least corrupt states, while Uttar Pradesh, Punjab and Tamil Nadu turned out to be the most corrupt states. 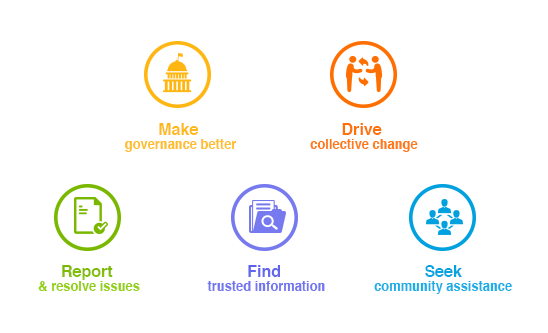 Transparency International India (TII) is a leading non-political, independent, non-governmental anti-corruption organisation of India. 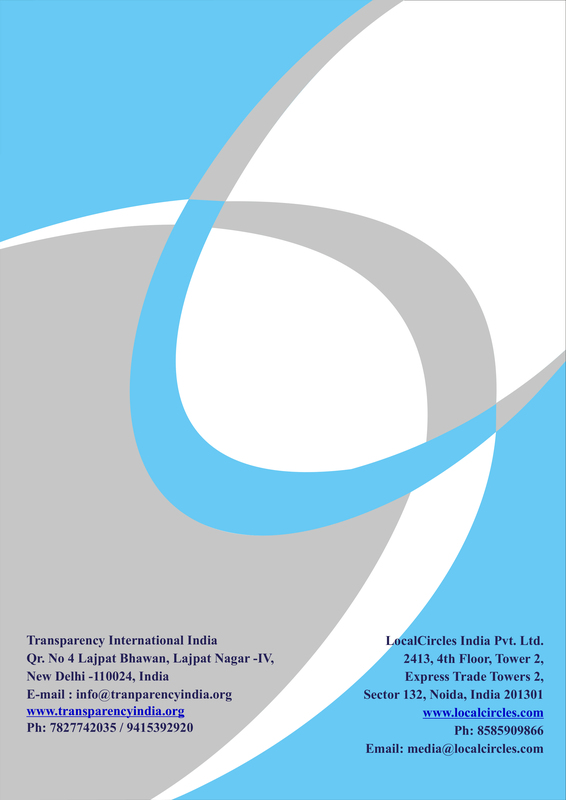 TII has extensive expertise and understanding of issues of corruption in India.